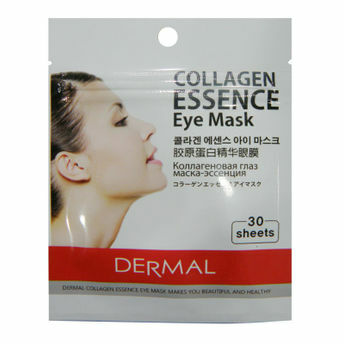 Dermal Collagen Essence Eye Masks deliver concentrated nutrients and moisturizers. These collagen eye masks have skin moisturizing, soothing, firming effects helping manage under-eye area. These eye masks include rich and nutritious essences and the sheet carries the rich essence deep in your skin giving you smooth, elastic and moisturised eye area. The eye mask contains collagen and arbutin which is very effective for keeping skin moist and soft also it effectively lightens and brightens dark spots under the eyes. The sheets are hypoallergenic to skin and the sheets stick on your skin very naturally. Also, the sheets moisturize dry skin around your eyes very well and they quickly and intensively carrie nutritious ingredients to your skin . The snail secretion filtrate and sodium hyaluronate also called hyaluronic acid will provide moisture around the eye area. Explore the entire range of Dark Circles & Wrinkles available on Nykaa. Shop more Dermal products here.You can browse through the complete world of Dermal Dark Circles & Wrinkles .